“Welcome to carbon monoxide city,” the email read. The author was a close friend of one of my cousins, a person I too would call friend though we likely hadn’t seen or spoke in some ten years. Still, as I’ve found, friendships in Asia, where the masses teem and a thousand languages from as many ancient countries are spoken, are invaluable treasures, not to be taken lightly. So when Bev and I announced our plans to move, my cousin and his wife had dinner with us and gave us the skinny on Haven, hearing about his adventures in Hanoi. Hanoi, for Americans, well we really only know the modern story; the war and Hanoi’s status as an enemy capital. But Hanoi is a thousand years old – one thousand and five, to be exact – and a city that old leaves stories behind that no person may truly know in the course of their lifetimes. The city has had different names, different dynasties, but it has remained the essentially Vietnamese city, their cultural center, and outside of the Imperial era when Hue held the honor, its eternal capital. Comparing Hanoi to Saigon is a difficult thing. Saigon is newer, modern, larger. Saigon’s story is a city of war – first a Khmer port, then a conquered Vietnamese prize, later, a capital of civil resistance. Hanoi is a city of kings. Its streets are narrow, twisting affairs, and given the Vietnamese attitude towards traffic laws, it is not hard to imagine the chaos of an Hanoian street. Bikes and scooters weave in and out between cars; outside of the city center in the “Old Quarter”, street lights and lanes are mere suggestions. Horns are ever present, something I remember from Saigon, the car horn is better used to signal than the blinking light. We were sitting around the “beer garden” on our last night in Hanoi, a tight intersection closed off to traffic at night where the bars and beer shops will set out small tables and tiny chairs on the corner. Here the famous Vietnamese “bia” is consumed in shocking quantities – but not nearly as shocking as the price tag after leaving Singapore. Ten to twenty thousand dong – or fifty cents to a dollar – per bottle of Tiger, Saigon or Bia Hanoi, you can imagine how long a crisp Hamilton can last you. As we sat drinking our Bia Saigon, looking at a police control trying to shoo tourists back towards the shops and not so far out into the street, I remarked that I was still trying to figure out Hanoi. Taxes are low. Corruption is high, but the country is the fastest growing economy in the world. The hammer and sickle hang from various places in the city – though not nearly as prevalent as in Saigon, I noticed with curiosity – but people laugh aloud, drink beer, do what they want, and embrace the Vietnamese lust for life. The city is dirty, brake dust and diesel fumes hang low, like the hated haze from late summer, but the weather was cool and pleasant, t-shirts and jeans weather, maybe a jacket at night. Hanoi looks old, wears its age with pride, like a stately window draped in furs and jewels. The opera house, the Metropole, Ho Chi Minh’s masoleum, they are the standouts in a city filled with old French colonial houses and buildings, tree-lined avenues, and hidden parts of the old citadel, which the city has grown around. The Old Quarter seethes with people, street hawkers and rickshaws and taxi drivers and tourists, but with the symbiosis of a functioning, healthy city, where stuff just works because why wouldn’t it, people gotta eat and drink and play and work and live, right? It is the mirror image of Singapore, but that’s neither a good thing nor a bad thing. It’s just different, diametrically so in some ways. The business district is outside of town, not its pulsing heart. The streets are controlled chaos, a dance of pedestrian, car and bike; not the orderly procession of cars and busses over underground, air-conditioned walkways. I saw one camera on a city street, directly overhead the beer garden, nestled in a maze of overhead wiring, thick black lines tracing the streets. I also saw an auntie holding a child – her grandchild, I presume – over a tree box on the sidewalk, encouraging him to do his business right then and there. Sunday morning, 7am, and the streets were filled with markets, Hoah Kiem Lake’s gorgeous pathways were filled with joggers, walkers and folks doing their morning tai chi. Come 9am that same Sunday, the streets were quiet, as people were in for brunch or packing the aisles at St. Josephs, a reproduction of the famous Notre Dame Cathedral, getting their weekly dose of Mass, held in Vietnamese, of course, but still able to be followed by an ex-Catholic. If anything, the weekend spent in Hanoi served to teach the beauty in differences, the celebration of those differences and how one lifestyle can be so dramatically different from another, and yet, everything seems to work and life goes on as it has. If my prose is circling and hard to follow, its only because the images in my head present themselves to me in much the same way. Nothing made sense in Hanoi, nothing fell into an easy categorization. It was chaos personified as a living, breathing city, and I loved every second of it. To provide a bit of a chronological reference, we flew into Noi Boi New Years’ Eve, opting to hire a car through our hotel for the night, the Sofitel Plaza, in West Lake, a bit north and apart from the Old Quarter. Sofitel is also the purveyor of the Metropole, but a room there was outside of ability, having been completely booked for the week. But the Plaza proved to be an amazing stay as well – the lobby bar where we met Haven and his wife, Chi, provided ample entertainment. This included the as-drunk-as-he-was-well-dressed man who had himself a Tony Montana moment shouting out “Free Palestine! Free West Bank!” while proclaiming that he was very well-to-do and would pay good money1a $100 US to anyone who would rise up and do just that. From Hanoi. All told, a rather scary moment considering the world climate. But nothing came of it. He was politely, but firmly, escorted upstairs, confirming that at least the hotel knew he had money. He did approach us, three of our party averting their eyes, except your intrepid author, who stupidly held his eye contact, giving no fucks for his cigar smoke, his money, or his terrible Scarface impression. As far as indignant drunken rants, I’ve seen better. Our celebrations led us to a literal hole in the wall expat bar not far from our hotel. The glitter, the flannel on the cool New Years’ Eve night and the pungent smells of, well, not durian, made me think for a second that we had stepped back in Portland. Especially since nearly everyone there was white. We drank cheap bia, I might have sampled some of the local not-durian flavor, and apparently the Dream of the Nineties is alive in Hanoi as the bar was selling balloons filled with nitrous oxide, something I haven’t seen anyone do since those heady years of high school. There was no countdown, no celebrity band, just a DJ spinning and a sudden, desperate cheer and copious amounts of booze as the clocks struck 00:00. I realized that I preferred 24-hour time, what better to start a new calendar year’s hopes for a better world than with all zeros? Carry not the baggage of twelves, I say. Whatever. I was pretty well and drunk at that moment. Which provided much drama the next day as we had set a 6am wakeup call. 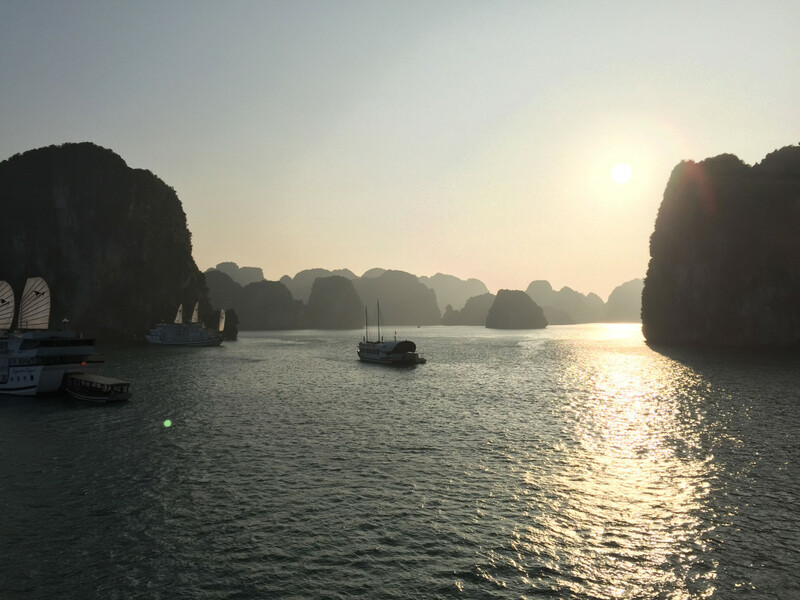 We were due – or so we thought – to be picked up at 7am for a four-hour drive out to Ha Long Bay for an overnight cruise. It turned out that our pickup was at 7:30, which, yes, doesn’t seem like much now, but at 6:45am on New Year’s Day, it was the world. I managed to get some coffee and food in me, and we went hunting for our driver, whom I found holding a sign with two names on it and one of them was “BRUCE”. I had a moments’ suspicion, but I asked the man if he were driving Bruce out to Ha Long Bay, he said yes, and we mounted up in his 4Runner. As we started out of town, two things dawned on me; one, that we were the only people able to fit in this car, and two, Beverly had made the reservation, and she wouldn’t have called herself Beverly Bruce. Oops. We had just taken someone else’s ride. Fortunately we sorted this out and within a few minutes we were back at the Sofitel with red faces introducing ourselves to Ms. Bruce and her family. My apologies, cousin. We didn’t have much time for pleasantries, though, as our bus had to pick up two more couples. The four hour drive out to Ha Long Bay was not remarkable in anyway outside of the fact that had this been in Calfornia, we’d have done the drive in an hour and a half. There are no freeways outside of the cities, and traffic outside of Hanoi was if anything, worse than in town. The same lax attitude towards traffic laws exist, however, so our ride became a harrowing trip of dodging on-coming traffic as we weaved in and out of “lanes” to overtake bikes and trucks. But like all things, the ride from hell came to an end, and we were rewarded with a night out in one of the most amazing places I’ve ever seen on this earth; Ha Long Bay. I won’t be able to do justice in words or my meager photography skills to capture just how beautiful Ha Long Bay is. Do yourselves a favor3all twenty of you – I’m quickly becoming an overnight sensation in this town and do a Google image search for Ha Long Bay4in fact, I’ve done it for you. I am nothing if not magnanimous.. Okay, got it? Amazing, no? Like I said, I can’t describe the majesty of it all adequately enough for this piece. The cruise we were on was an overnight affair, about a four-to-five hour journey east out into the bay, with a stop at a fishing village where rowers on bamboo boats supplemented their fishing income with tours of their floating homes amongst the limestone cliffs. The food and drink were amazing, and the tour, run by Indochina Sails, was planned with expertise. We beat the crowds to the fishing village, and in the early morning after, to a limestone cave, a hollow island with a small two-chamber cave inside. We sat out on the sundeck at night, having5ridiculously cheap cocktails and digestifs, watching the stars peek out from behind the clouds, anchored in a small cove with several other ships. The chef entertained us with how to cut various fruits and vegetables in flower shapes, while cards and dominos came out. I spent the later moments of the night chatting with a man from Toronto, sipping on good scotch, talking American football and baseball under Orion’s watchful gaze. It was, to put it plainly, an incredible way to begin a new year. After the caves and the fishing villages and wonderful food, it was time again to brave that four-hour long death ride back to Hanoi, back to the grit and the grime and the chaos. But I didn’t mind the destination. Ahead of me was amazing cuisine, cheap massages and a city so teeming of life, that the idea of spending four hours in a swerving, speeding bus on a slow road through the backwaters of Vietnam gave me no pause. Such is Hanoi, the anthesis to my new city, a lesson in how wonderful life is even when lived in the opposite direction.